This recipe for Kolhapuri Misal comes from the famous Maharashtrian city of Kolhapur! It is a city named after the demon Kolhasura, whose dying wish it was that the city be named after him. Kolhapur Mahalakshmi Temple. It is one of the six Shakti peethas. I love the peaceful ambiance of this temple. 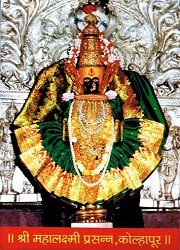 Traditionally,Venkateshwara bhaktas who visit Tirupati must visit Kolhapur Mahalakshmi Temple for their pilgrimage to be considered complete. That is how I got acquainted with this lovely city. It is the nerve centre for sugar production in Maharashtra; I always come back laden with jaggery and molasses. Kolhapuri Chappal, a particular type of leather slipper. If you lay your hands on the genuine article, it will last you ages and ages, and become more comfortable with each wear. I am loathe to discard my old kolhapuris even if they are falling apart. Jewellery. The Kolhapuri Saaj is a particular favourite with Maharashtrian brides. Marathi Film Industry. Apparently, the legendary silent movie Raja Harishchandra was conceptualised here. And of course food! Kolhapur is famous for spicy non-vegetarian food; especially its mutton dishes. Foodies will wax eloquent about Tambada Rassa (mutton in red gravy) and Pandhara Rassa (mutton in white gravy). In many Mumbai restaurants, there will always be a Vegetable Kolhapuri or Chicken Kolhapuri on the menu. This is the dish of choice for anyone with a craving for spicy food. Unfortunately, most of these dishes are just spicy and bear no resemblance to the original Kolhapuri cuisine. One of the vegetarian dishes that Kolhapur is very famous for is Misal. Misal literally means mixture, and that is what this dish is all about. It is a mix of sprouts, onions, tomatoes, peanuts, spices, and some farsan. A Misal essentially consists of two components; usal (sprouts) and kat or rassa (the gravy). There are two versions of Misal popular in Maharashtra; Kolhapuri Misal and Puneri Misal. Kolhapuri Misal is very spicy unlike its competitor the Puneri Misal, which is comparatively milder. If you get a Punekar and a Kolhapuri together, they can argue for hours on the merits of Puneri Misal and Kohalpuri Misal; and demerits thereof! Do try my recipe for Farali Misal made with Potato and Sabudana. This is eaten on days of fasting such as Navratri and Ekadashi. Given how long this post has gone on, you must wonder, if I will ever get to the recipe. 🙂 Here it is! After the matki has been soaked, drain the water. Wrap in a cotton cloth and set aside in a warm place for 6 to 8 hours. Place the soaked sprouts in a casserole and set aside for 6 to 8 hours. Chop the tomato into fine pieces. In a heavy bottomed pan, dry roast coriander seeds, cumin seeds, pepper corns, cloves, sesame seeds, fennel seeds. Grind the roasted spices to a fine powder. Add the red chilli powder and mix well. In a heavy bottomed vessel, heat 1 tbsp oil. Add the garlic pods and stir fry till it starts to change colour. Add the onion and stir fry till it starts to become golden brown. Add the tomato pieces and stir fry till the tomato pieces are stewed. Add the ground masala and stir fry for 5 to 7 minutes till the raw smell disappears. Grind the tomato-onion mix, dried coconut and fresh coconut to a smooth paste. Heat 1 tbsp of oil. Add the ground masala, turmeric, and asafoetida. Stir fry till the oil leaves the sides. Add about 4 cups of water. Add grated jaggery, salt and tamarind paste. Peel and chop the potato into 1/2″ cubes. Add the potatoes and stir-fry till it starts to turn light-brown. Add the peanuts and stir-fry till the peanuts start to pop. Add the sprouts and stir-fry for 5 minutes. Cook covered till the potato and sprouts are soft. Stir occasionally. Add just a pinch of salt and mix well. Cut the lemon into quarters. Ladle about 1/4 cup cooked usal/sprouts. Pour about a cup of Rassa/Kat over the usal. Garnish with farsan, onion, and tomatoes. Serve the Kolhapuri Misal with Laadi Pav and Lemon Wedge. I made misal using this recipe. It tasted awesome. thanks for sharing the recipe. i love Kolhapuri slippers and ur recipe too. Love misal paav! Your recipe looks great! I didn’t know about the rassa being cooked separately! thanks! miss the yummy yummy mumbai taste. This sounds really delicious and thank you so much for bringing to Fiesta Friday! This sounds a little complicated but you have explained it very clearly with easy-to-read instructions. Mouthwatering! wow this looks so yummy, I love street food! There is something lovely about street food the world over, isn’t there? In fact, I loved the Kolhapur street food when I out there and this is the first time I visited the Mahalakshmi temple. Loved being there. Though I missed out on the Kolhapuri chappal. Don’t let a punekar catch you say that! so many things in this i have never heard of! looks and reads great though! sounds delicious and healthy. I still have to try the street food form western India.